Review of Rudolf Nureyev’s frenetic Don Quixote at La Scala which sees top-notch dancing if some third-rate acting. Nicoletta Manni and Timofej Andrijashenko star. Rudolf Nureyev’s Don Quixote is a romp. From start to finish it zips along at a frenetic pace, with frenetic steps. That is, except the prologue — Don Quixote’s house — and a prolonged mime scene in the Act Three tavern scene. Unfortunately, for the revival at La Scala, these scenes seem to have been left as an afterthought in the rehearsal process for the dancing is very fine indeed, but the acting is often way off the mark: mistiming of gags, hammy characterisation (old man Don Q staggers around the stage with his legs apart as though he’s wet his nappy), and the unbelievability of the situations. If the characters in their costumes are overblown, they can be played as real people, not for laughs – they are already absurd and funny from the moment they walk on stage. Overacting kills comedy. Gianluca Schiavoni as Sancho Panza was one of the few saved by restraint. The dancing by La Scala’s current clutch of 20-somethings however was first rate. Nicoletta Manni radiated mischief and charm and was a Kitri who looks down on her fellow villagers with amusement and pity. It’s as if she knows that soon she will escape from humdrum village life, though marrying a barber is an improbable route out of the village… Act Four: she divorces Basilio and marries Don Quixote? Manni’s confidence in her technique is supreme – triple pirouettes, her 32 fouettés almost on the spot with double turns throughout, balances found on every arabesque relevé — but she is also blooming as an artist, and became the focal point of every scene she was in. Her Basilio was Timofej Andrijashenko, a fine dancer with danseur noble lines and comportment. He’s not a natural Basilio having none of the wicked glint in his eye that Baryshnikov had (curiously, both men are from Riga) though he does come across as sweet and loveable, so it is understandable that Kitri is smitten. This run marks his debut in the role and he wasn’t completely at ease with Nureyev’s challenging and sometimes awkward choreography, and occasionally tempi slowed down too much to accommodate him, yet the almost impossible combination of double turns in the air landing each time in arabesque, alternating from left to right, four times, he carried off marvellously. When Leonid Sarafanov danced the role at La Scala in 2011, for example, he chose to do three of these combinations in a diagonal across the stage on the same leg, a simpler alternative which was in Nureyev’s earlier versions of the ballet (Nureyev dances this variation in the Australian Ballet video filmed in 1972). Andrijashenko needs time to get the steps and the character into his head and body. Later in the year the company will be taking the ballet to Australia and China and he’ll certainly have the success there that he deserves. 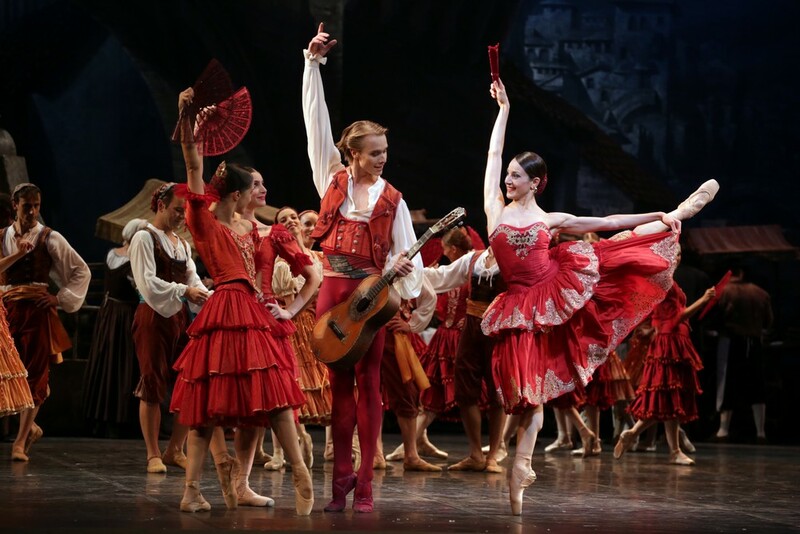 Martina Arduino’s fiery and flirty Street Dancer was an enticing appetiser before her debut as Kitri in the last performance of the present run, and Espada was Marco Agostino, (who will be Arduino’s Basilio), who had bravado fun with his cape. The way Nureyev moves the six toreadors and Espada from the back of the stage to the orchestra pit, with just one shoulder tilted toward the audience, is an example of his masterfulness at handling groups with simple yet effective patterns. Similarly seen with the final act fandango, the gypsy dances and, of course, the end of the first and third acts with the entire company continuing to dance as the curtains close. Virna Toppi was a cool and confident Queen of the Dryads, and Antonella Albano made a cute Cupid. Antonino Sutera as the Gypsy gave his super-energetic all, as always. Two of the most glittering performances though, came from Kitri’s friends, beautifully danced by Alessandra Vassallo and Caterina Bianchi who were poised, playful and thoroughly charming.